Each “Testing Testing” post analyzes a released test item, focusing on both the mathematics and interface involved in the new breed of exams. Our goal is to help improve the quality of these exams, especially if they may be used to inform student graduation or teacher merit pay. The mathematical analysis here is from Al Cuoco, director of the Center for Mathematics Education at EDC, from the Trevi Fountain in Rome. I provide the interface analysis. Here’s Problem 4 from the SBAC Grade 11 Math Practice Test. 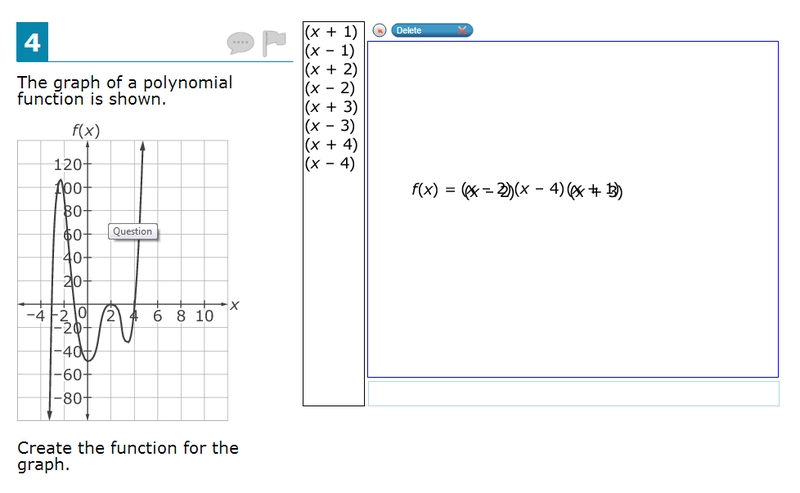 HSA-APR.B.3: Identify zeros of polynomials when suitable factorizations are available, and use the zeros to construct a rough graph of the function defined by the polynomial. This problem doesn’t ask students to do that. 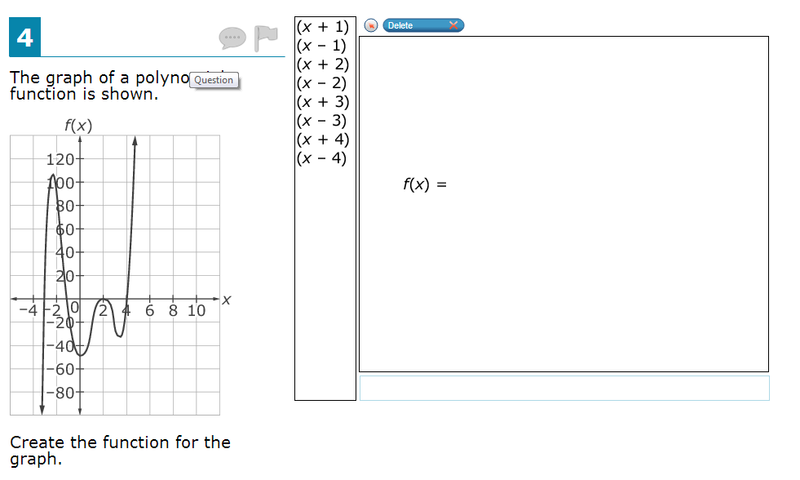 It asks students to use a rough sketch of a graph to build a factorization, identifying the linear factors of the underlying polynomial. Besides this, there are some serious mathematical issues with this item as presented. The correct answer to this type of problem should start out in one’s mind as a multiple of , applying the Remainder Theorem (HSA-APR.B.2). Then, you check a sixth point to find the multiple, making sure the polynomial agrees with the nonzero points on the graph (a polynomial function of degree n is determined by n+1 function values, not just its n roots). But no coordinates of a sixth point are given. A student could simply not think of this and get the problem right, or estimate the value of the function at 0 and see if the graph is approximately correct (and get it right), or assume that this is a test and read the minds of the test writers (and get it right). 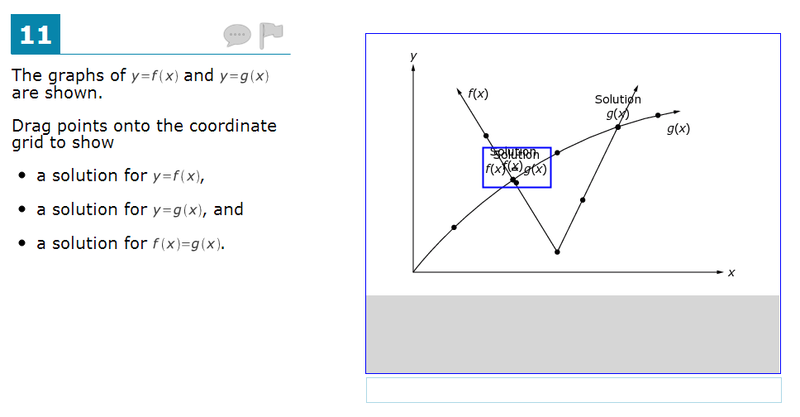 It’s a good thing the graph seems to pass through (0, -48), or there would be no way to give a correct answer! Even if you could get the exact coordinates of f(0), there are other polynomials functions whose graphs contain these same points and that have an extra x-intercept off the picture. The phrase “the function for the graph” is not accurate: there is more than one. Better wording: “Find a polynomial function that could have this graph.” The phrase “Create the function” should also be avoided, since it’s not clear what it means; Common Core has students “define” a function or “build” a function for modeling or transformation. Students who can sketch the graph of g (or answer questions about the graph) have met several HSA-APR standards. Separate from the mathematics, there are a few major interface issues with this problem. Students are only allowed to drag linear factors to the right, so it is not possible for a student to enter . They must instead enter the clumsy . Some students will wonder why they have to do it this way, others will think the interface is broken. It’s an unnecessary hurdle that will prevent some students from answering correctly even though they are capable of completing the task on paper. We can picture a student trying to do this on purpose, attempting to get the term. It easily happens by accident and the interface for “deleting” objects is not obvious. Would the answer above be marked correct or incorrect? It’s not clear, and that is a big problem. The SBAC Practice Tests are available for public viewing, and we are grateful to have these problems available for public comment. Each “Testing Testing” post will analyze a released test item, focusing on both the mathematics and interface involved in the new breed of SBAC and PARCC exams. Interfaces can have huge effects on how problems are posed, read, answered, and scored. Posts will also provide suggestions on how to improve these exams, in terms of the mathematics presented, and also in terms of the interface students will use when taking exams. This problem targets HSA-REI-D.10 and HSA-REI.D.11, knowing that the points on a graph are the solutions to the corresponding equation, and that the x-coordinates of the points where the graphs of y = f(x) and y = g(x) intersect are the solutions of the equation f(x) = g(x). The problem interface will not allow the third point to be placed here. A placed point “snaps” to the nearest marked point on the grid. These interface behaviors need to be described in the problem, or the results can be surprising or frustrating. 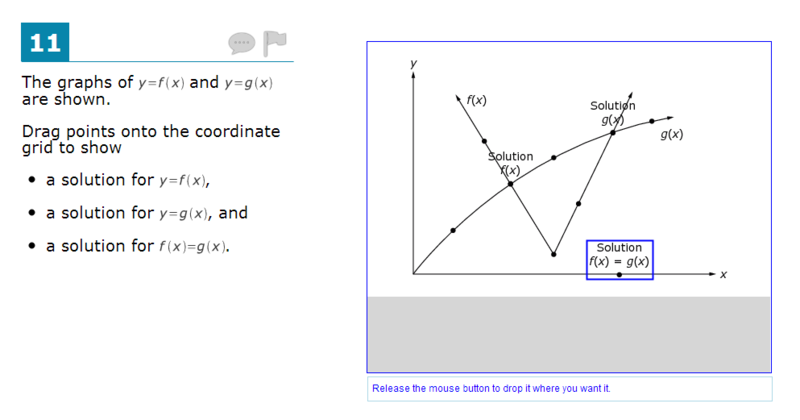 For example, a student might want to place their solution to y = g(x) at (0,0). The problem doesn’t exclude them from doing this, but the interface does. Note that the newly placed point is not in the same position as the original. I can’t tell whether or not this solution would be accepted on the exam, and fixing the problem requires moving away the new point, then the old point, then replacing the new point. It’s a mess. If the exam requires all three points to be different from one another, this needs to be part of the problem statement, and the interface should “push” old points back to the gray area at the bottom if a new point is placed in the same location. These interface issues can be fixed. Eliminate the dragging, label each target point in the grid, and ask the questions about the specific points. This also allows more explicit asking about HSA-REI.D.11 rather than the previous “solution for f(x) = g(x)”. This new version keeps alive what makes the original question better than multiple-choice: there are several correct answers to each part. 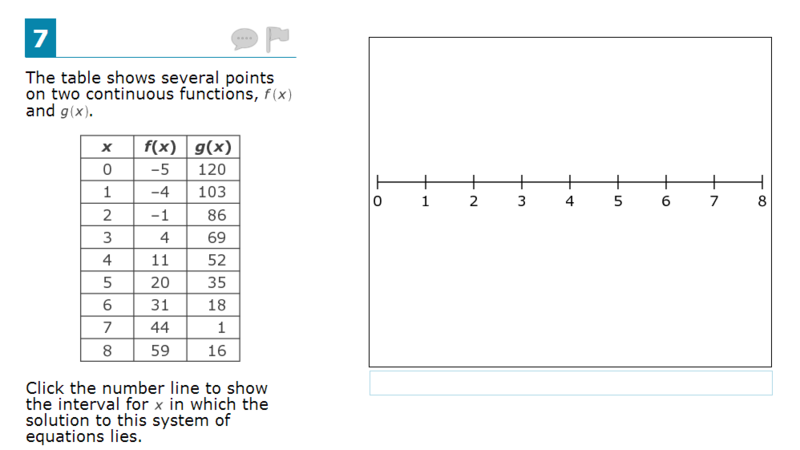 One might consider changing this version (or the original) to require the student to provide points that are on the graph of one function and not the other: “Name a point that is a solution to y = f(x) but not y = g(x)”. Otherwise, a student can answer all three questions correctly with “C” without assurance that they have mastered the standard. We’re starting a new category of post here called “Testing Testing”. Each post will analyze a released test item. While this would normally focus just on the mathematics of the problem, the SBAC and PARCC exams are also promising new formats and interfaces for testing, which can potentially have effects on how problems are posed, read, answered, and scored. Writing assessment items for these new interfaces will be especially challenging, and it may take more revisions than usual to build a high-quality test item. Recently, SBAC (short for Smarter Balanced Assessment Consortium) released a set of Practice Tests, giving everyone the chance to study the testing environment and suggest improvements. I took the 11th grade mathematics exam, with 23 problems, trying to get a sense of the quality of the mathematics and the quality of the interface. Several posts will talk about items from the SBAC Practice Test, along with suggestions to SBAC on how to improve both the mathematics of the exam and the interface students will use when taking it. 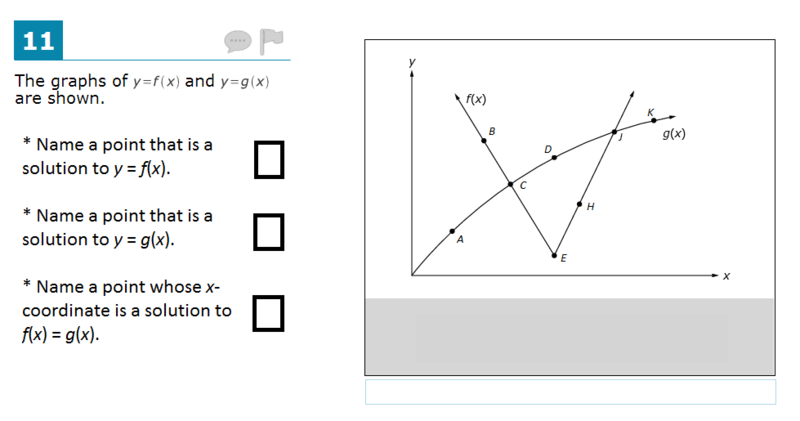 Here’s Problem 7 from the SBAC Grade 11 Math Practice Test. At first glance, this problem looks pretty innocent, and has a useful testing target, specifically HSA-REI.D.11, finding approximate solutions to f(x) = g(x) when f and g are given by tables. The test designers were even careful to use function types prescribed by the standard: there’s a quadratic rule matching f and an absolute value rule matching g. This could have been a good item, expecting students to interpret the table in a meaningful way. However, there are two serious errors in the problem. First, the problem is never stated. The problem asks to “show the interval for x in which the solution to this system of equations lies”. But there is no system of equations. There’s not even an equation at all, just a table. To get this question right, the student must figure out the intended question, the interval for x that contains the solution to f(x) = g(x). Note that this still isn’t a system of equations, just a single equation with a single variable. Because f and g are continuous, we know they must intersect somewhere between x=5 and x=6, but we do not know for certain that they will not intersect elsewhere. These issues are very serious and require correction. There are other minor issues: “f(x)” isn’t a function, it’s an output of the function f (see HSF-IF.A.1). 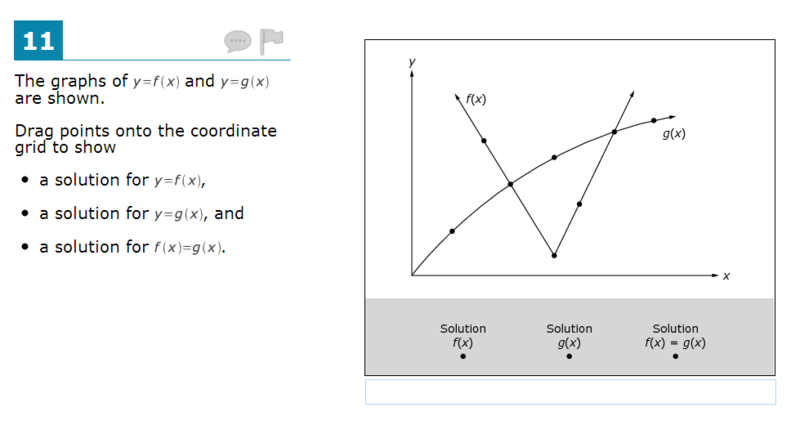 Functions don’t have points, they have ordered pairs; graphs of functions have points. Neither of these minor issues spells doom for the problem, but these details can be corrected. 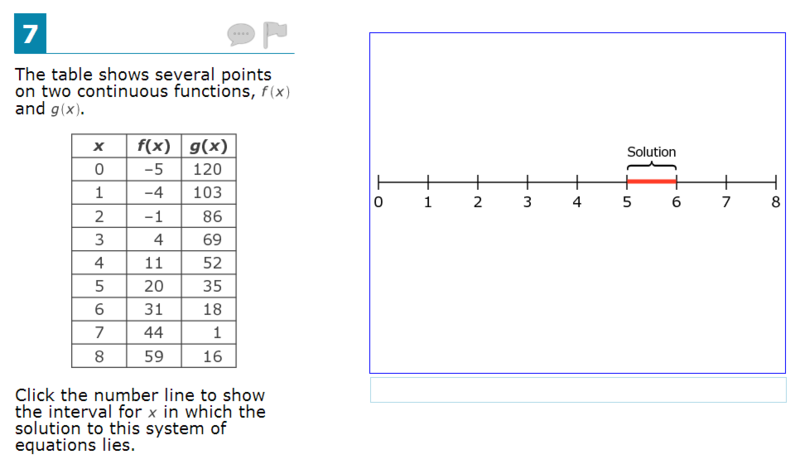 On the plus side, the interface for the problem is clean and the task for the student is clear (“Click the number line”). Clicking marks a unit interval in red, and clicking anywhere else changes the interval to reflect the new click. I encourage you to take the SBAC Practice Test. I’ll have more to say about other problems. My hope is that through the work of the community we can improve these exams while they are still in their pilot stage.